Don't like those Rear Window Wipers? Remove it and simply cover the resulting hole with one (1) of our Domed Gems. With a thickness of about 1/16" (1.5875mm), Gem is available in a wide variety of colors and offers a great solution to finish off your vehicle. 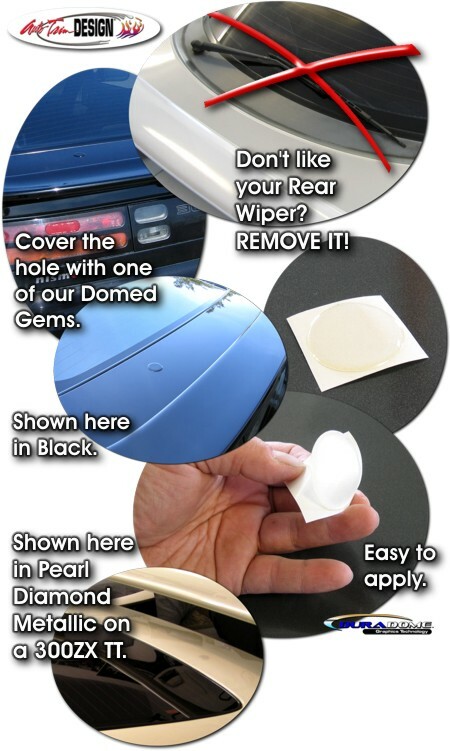 "Domed" gems are not just vinyl decals. They are a tactile, three (3) dimensional decal that dries somewhat rigid so as to keep the elements out. It's very easy to install and includes easy-to-follow general online instructions. Get yours today! Please note: We recommend the gem to be at least 1/4" (6.35mm) larger in diameter than the hole you are covering. While the Gem is more rigid than simple vinyl, care should be taken to not puncture it, especially on hot days. Lastly, Gem is offered purely for cosmetic use and should not be considered as a permanent solution. As with decals, this item can be removed at a later date in the event you choose to reinstall the Rear Window Wiper or have the hole permanently filled in.